Perf 14½x14, no wmk, photo. Printed by Harrison, London. Perf 13x12½, no wmk, engraved. Printed by De La Rue, London. Tim Balm (FICC #91) wrote a masterful summary of Trucial States (including the origin of the name) for Journal v16n2p4, summarised below. The Trucial States were a group of seven sheikdoms located on the desert coast along the south side of the Persian Gulf – just east of Saudi Arabia. The sheikdoms included Abu Dhabi, Ajman, Dubai, Fujeira, Ras al Khaima, Sharjah and Umm al Qiwain. There was little economic activity in this area in the 1800s, so piracy and smuggling were rampant. In fact, this area was also known as the Pirate Coast. Because merchants from India (under British rule at this time) were frequently victims of the piracy, Britain arranged for a truce among the sheikdoms (thus giving this area the name Trucial States) and declared them a British Protectorate. A large change in economy for this area occurred in the late 1950s when oil reserves were found. 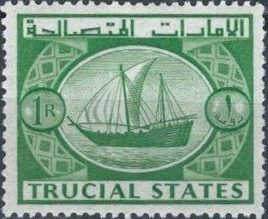 With this new prosperity, the Trucial States began printing their own postage stamps in 1961 – even though the population was largely illiterate. In fact, the only post office in the seven sheikdoms was in Dubai (established by the British in 1909). As the local economy continued to strengthen, each sheik decided to issue individual stamps for his sheikdom. 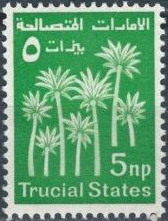 Thus, the 11-stamp Trucial States set of stamps was withdrawn from sale in June of 1963. Only Abu Dhabi established a postal system to go with their stamps (although the British post office was still present in Dubai). The other sheikdoms simply flooded the market with new issues having little or no valid postal use. The flurry of sand dune stamps continued until the United Arab Emirates was established in 1971-72. The Scott catalogue lists the initial set of stamps for each sheikdom, but does not list the vast majority of the issues.